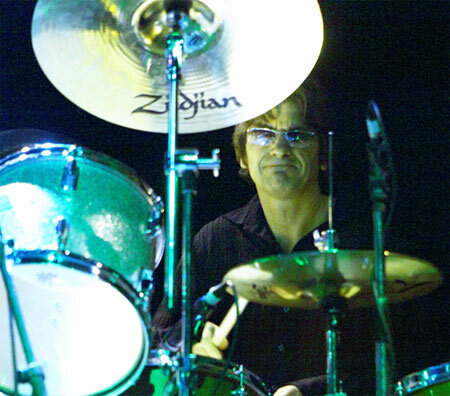 Ray, a 30 year veteran of the British pop scene, began his drumming career studying with the legendary Scottish drummer George McGowan as well as London great Bob Armstrong, whose former students include such luminaries as Oasis’s Alan White, and The Who’s Zak Starkey. Ray began playing professionally in Glasgow and at the age of 20 made the move to London to join the Scottish band Contraband who had been signed with Transatlantic Records. From then on he became a fixture on the London scene, playing and recording with such greats as Robert Palmer, Tom Jones, Big Audio Dynamite, Wishbone Ash, Bjork, Bill Wyman, Andy Summers, Adrian Smith (Iron Maiden), Mick Jones (The Clash), Gavin Rossdale (Bush), lulu, Ultravox, Belinda Carlisle, Peter Green ( Fleetwood Mac) Del Shannon, Right Said Fred, Rolf Harris, T’pau, The Bay City Rollers, Steve Howe (Yes). Ray’s website is here http://raywestondrums.com.